Many of us who purchase a car might not always be happy with the initial paint color. Perhaps you bought your car because there was a very good deal on it and it was the only car that fit your budget at the time. Either that or the paint on your car might have gotten scratched or too dirty over the years that you’ve used it. Whatever your reason, there will come a time when you’ll want to paint your car to give it a fresh new look. People who want to sell their vehicles will often do this to make their car look more attractive to buyers. Like many car owners who are on a budget, you probably cannot afford to spend thousands of dollars on a fancy new paint job from your local auto painting service. This means you need to do the paint job yourself. If your only expense were to purchase supplies and tools, you would likely want to keep your expenses under $300. Below are the 5 best tips for painting your car for under $300. Remove Rust – Rust typically forms on the steel of cars because of constant exposure to water and moisture. Before you even start a paint job, you need to make sure all the existing rust is removed from the exterior. There are two ways you can do this. You can either remove the rusted metal completely and then weld on a new piece of metal, or you can use chemicals to remove the rust. The chemical option is better for light rust problems while the cutting and welding are better for serious rust issues. 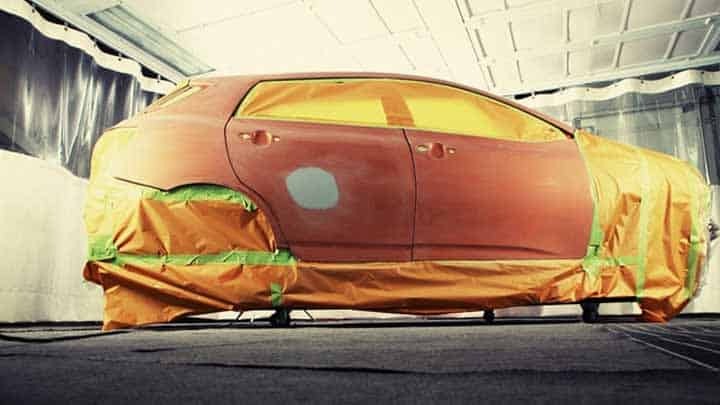 Body Filler – The panel of your vehicle’s body may have dents and holes in the metal that would certainly not look good with a new paint job. So, you need to add body filler to the panels in order to smooth them over and fill in the holes first. Try to use higher quality fillers that will last a long time. It is worth spending a few extra bucks on them. That way, it will keep your paint job looking new for a longer time. Paint Indoors – You might feel tempted to paint in your driveway because there is a lot more room and space out there. The problem is that wind outside could blow dirt onto the paint of your vehicle while it’s still fresh. Plus, you could end up accidentally painting the grass or exterior of your house as well. The best way is to paint your car inside of a garage that can hold at least two cars. This will give you just the right amount of space to work. To protect your garage, hang up drop cloths or worn curtains around the work area so you don’t get paint on the walls in there. Ventilation – If you want to save money on having to buy an exhaust fan, just purchase a regular box fan and then attach a furnace filter to it with tape. This will ensure the painting area is properly ventilated and the toxic fumes are filtered, so they don’t harm your health. It will also prevent residue from the chemicals and paint from sticking to other things inside your garage. Buy on eBay – You can find all the supplies you need to paint your car on eBay. Usually, there are either people with unused supplies or vendors who sell these supplies cheap. Just go to the eBay Motors category and choose the Parts & Accessories subcategory. Type in “car painting supplies” to find what you’re looking for.